Do you know that you could convert your PowerPoint presentation to PDF in Office 2010 and 2007? Yes, this can be accomplished without using any third party tool! Microsoft PowerPoint is a great tool for creating impressive slides with great fonts and images. PowerPoint presentations are usually made with a lot of graphics to reinforce the information that the presenter is presenting. A good PowerPoint presenter usually shares the PowerPoint slides with his audience, a few days before the actual presentation. This gives the audience a high level idea of what will happen during the presentation session and this would also make the session more interactive. The presenter could choose to share a PDF document of the PowerPoint presentation, as PDF is a great way to share documents by email or any other means and the content cannot be easily changed. 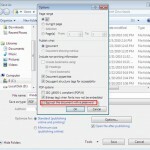 It is easy to convert PPT to PDF in Office 2010 and 2007. Moreover, the PDF copy of the PowerPoint preserves the fonts, images and the formatting! The PDF documents would also look the same on most computers. How to convert PowerPoint (PPT) to PDF? 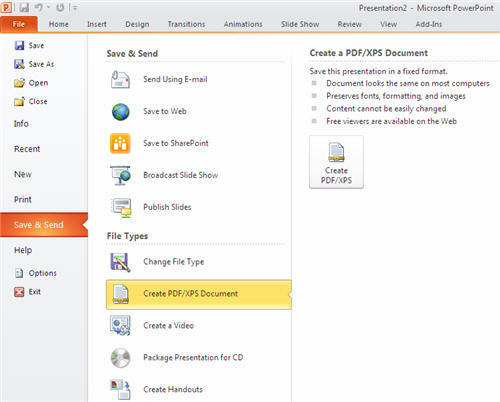 In PowerPoint 2010, click File >> Save & Send >> Create PDF/XPS document. 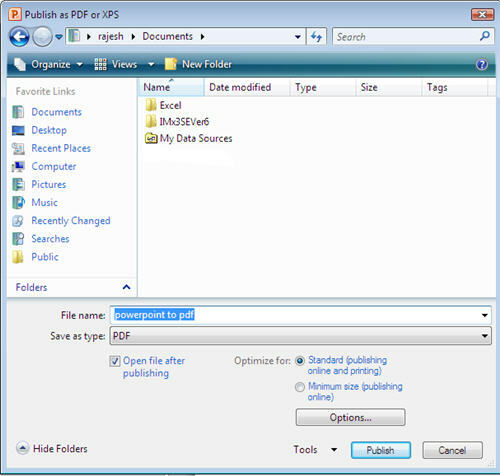 You could also optimize the PDF file for online publishing and printing, by choosing “Standard” or “Minimum Size” options, while saving the PDF. For PowerPoint 2007, a microsoft add-in was released to publish PPT as PDF. After installing the add-in, you need to open the presentation, Click on the “Office” button in the top left corner of PowerPoint 2007, choose “Save as” and click on PDF or XPS in the pop-up menu.You will then be presented with a “Publish as PDF or XPS” dialog box. You then have to specify a location to save the converted PDF file. While PowerPoint is a great tool to create impressive diagrams, PDF is a great way to share content as it reduces the file size considerably.Convert PPT to PDF and share PowerPoint presentations with ease.